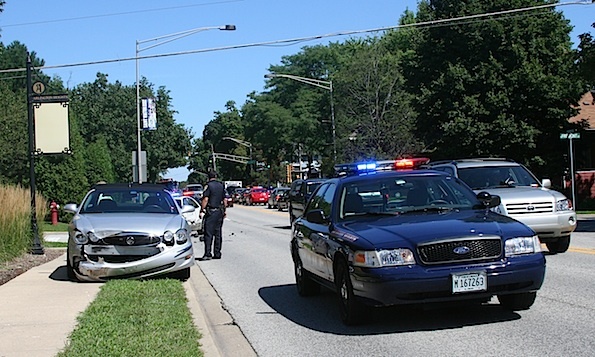 Arlington Heights police and firefighter/paramedics responded about 11:05 a.m. Sunday to crash with injuries at Arlington Heights Road and Euclid Avenue. Police arrived to find a three-car crash in the intersection. During the management of the first crash, a second crash occurred at Arlington Heights Road and Fremont Street one block south of the first crash. Both drivers were walking after the crash, and seemed to be uninjured. Traffic was moderately heavy for a Sunday with the “Walk in the Park Art Show” underway at the North School Park. Euclid Avenue was blocked in both directions, east of Arlington Heights Road for about 45 minutes. View looking north from Fremont and Arlington Heights Road near second crash scene with first crash scene in the background at Euclid Avenue.